Brad Main was among Top Club Reserves' scorers. 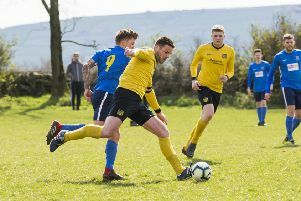 Top Club Reserves played out an entertaining 10-goal thriller on a heavy Savile Park surface, but came out second best against Halifax Rangers. The hosts moved into third spot in Division Two of The Ziggys Metro Cars Halifax Sunday League with a 6-4 victory. It was the higher-placed home side who burst out of the blocks, as Top Club found themselves two goals down inside six minutes. Peter Bowe snapped up the first with just five minutes played, before a minute later confusion reigned in the visitors’ penalty area culminating in Chris Waddington poking home from close range. The response was good from the Rastrick side; Gary Nicholson had an effort cleared off the line, whilst a probing Brad Main through ball put Ryan Barkham in the clear, but having rounded the keeper a horrible bobble meant his shot sailed over the bar. Josh Milthorpe made a diving save to keep a right wing shot out at the other end, before the skill of Barkham saw Top Club pull a goal back. He tormented down the left flank before providing Dom McLeod with a tap in. The joy was short lived. however, as within two minutes Rangers had restored their two-goal cushion. Matt Smith found the corner of the visitors’ net despite Milthorpe getting a hand to his well struck shot. Top Club managed to restore parity with Barkham very much to the fore. His pass to McLeod yielded a goal as the front man nonchalantly placed a left-foot effort into the corner of the net. An Andy Bowe foul gave the visitors a good set-piece opportunity from which the equaliser came, Barkham almost inevitably providing the assist, allowing Main to stoop at the back post to head home. Rangers rallied and took a morale-boosting lead into the interval. The ball fell nicely into the path of Waddington and his calm finish gave the promotion chasers the lead back. The start of the second half had an air of déjà vu as Rangers once again caught Top Club cold and struck early. Sean Byrne broke and restored his side’s two-goal cushion. The visitors introduced Adam Clayton up front and he had two great opportunities to get his side back into the match, but Rangers keeper Josh Ward twice denied him. A goal was pulled back after the tenacity of Nicholson in midfield paved the way for Robert Turner to coolly slotted home. Any late revival hopes were dashed when a Ward punt up field was misjudged in the wind by Nicholson, who looped a header back over his own keeper. Matthew Spink saw a late header saved by Ward, but Rangers held out for a 6-4 victory to cement their place as promotion contenders; whilst defeat left Top Club ninth. In Division One, Barge FC picked up a valuable 2-0 victory over fellow promotion- hopefuls Ovenden BCFC, to the delight of Matthew Bagshaw. Andy Salm and David Woffenden scored for the Brighouse side, but the manager was also quick to praise keeper Peter Jennings who made some excellent second half saves to deny the home side a route back. Division Two: Top Club Reserves v Crown FC (Carr Green Rec).